Trends indicate that when voter turnout rises in the state, the party’s vote share falls. So when more people in Gujarat come out to vote, they most often are voting for the opposition. The odds against the Bharatiya Janata Party (BJP) in the recent Gujarat election were quite high. In power for over two decades, the party was dealing with an inevitable anti-incumbency, distress from demonetisation and a botched Goods and Services Tax, growing discontent among its traditional base of Patidars and traders and a fresh crop of young local leaders. There were several signs that the saffron party may lose Gujarat, what then accounts for the BJP’s remarkable return to power? Behind the party’s success is a superior electoral machine in which party cadres fan out to every polling station, an astute leadership that micromanages strategy at the constituency level, an ever-present willingness to stir up religious animosities to shore up Hindu votes and a redoubtable campaigner in Narendra Modi. 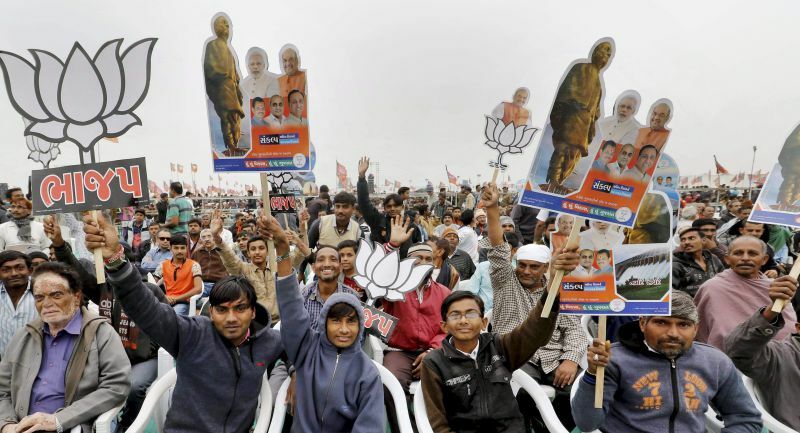 There is another factor in the BJP’s continued success in the state – an unwavering voter base. The party consistently secured above 47% of the votes cast in the last four state elections. This suggests two things: first, at the margins, the BJP may lose some support every election (such as those of some Patidars this election) and gain a few new supporters (perhaps those of the Scheduled Tribes in the southern districts this time), but a sizeable segment of its voters remains firmly attached to the party. Second, this voter base may get disillusioned with the party and protest in the streets, but they reliably turn out on polling day and vote for their party. What is the BJP’s source of strength also turns out to be its weakness. Its vote base has remained constant over these elections, showing no signs of growing; it appears to have leveled off. The party’s failure to reach its set 150-seat mark, in order to beat the Congress’s old record of 149 seats, reflects this underlying weakness. This weakness can have more damaging consequences for the BJP as it is tellingly revealed in the relation between voter turnout and the party’s electoral fortunes. As the turnout rises, the party’s vote share falls. So steady is this trend that a higher turnout in the state and in the constituencies may reliably be interpreted as a vote for the opposition. 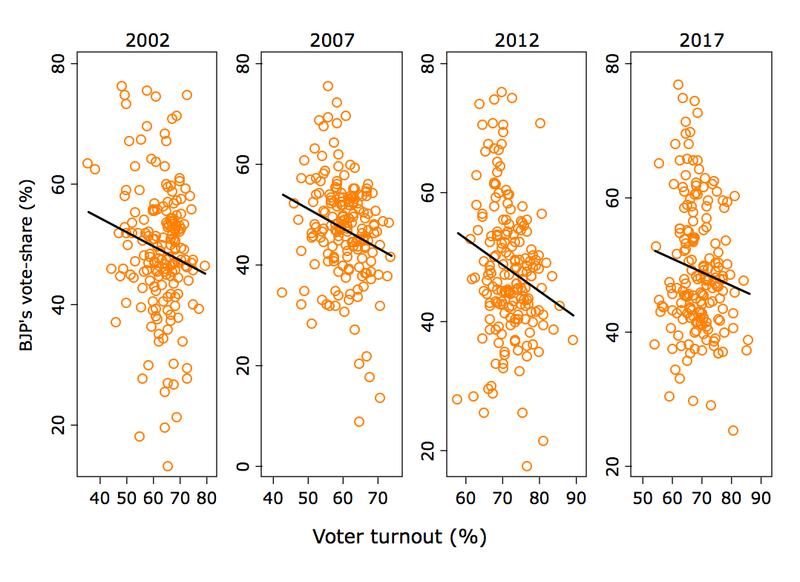 In fact, electoral fortunes flip when voter turnout hits the 75% mark. 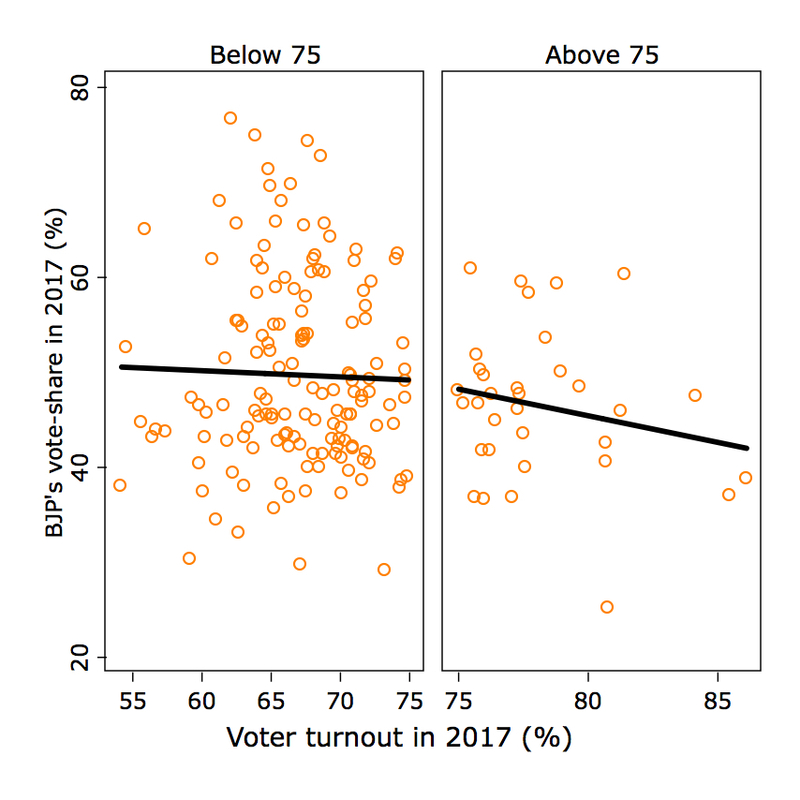 Consider the constituency-level results from the 2017 election: the BJP’s vote share starts declining sharply after the 75% mark (This is true of older elections as well. See here). When more people in Gujarat turn out to vote, they most often are voting for the opposition. And these opposition votes add up to more opposition seats as well: when more than 75% of the electorate take part in elections, the BJP’s odds of winning the seat drops below 50%. 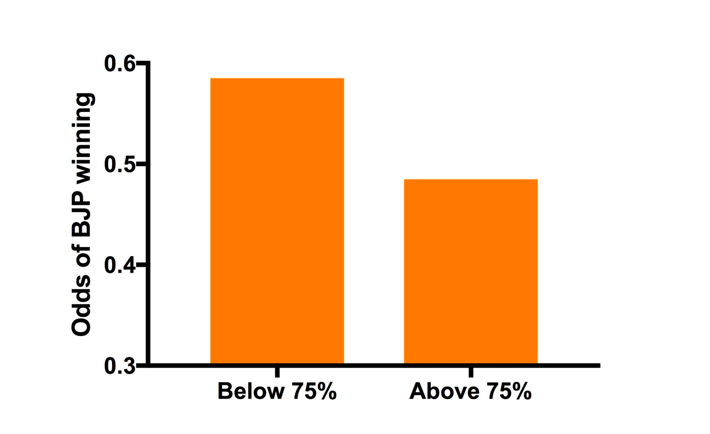 That is, in most of the constituencies that witness higher than 75% polling, the opposition wins. This scenario should furnish opposition political parties with a seemingly simple means to alter the state’s electoral scene and unseat the BJP – getting more people to vote. Shame then that the BJP’s main rival, the Congress, has not been able to capitalise on a strategy that boosts turnout. The overall polling in the state this time was a tad bit over 68% and just a fifth of the constituencies witnessed higher than 75% turnout. The Congress’s weaknesses are all too familiar: a weak organisation that becomes active in the state when elections near, a leadership and a vision that has so far failed to inspire that even voters who find the BJP’s politics toxic do not consider voting for it. This time, despite an energetic election campaign and an apt message of inclusive economic development and social justice, the Congress eventually remained a confederacy of discontents rather than a coherent credible party. And, as the voter turnout shows, the discontented voters stayed away from polling stations in several constituencies. In a state such as Gujarat and with a formidable adversary like the BJP, the Congress cannot hope to win if it becomes active only during elections. It needs an organisation that can take its message to the grassroots and make it resonate continuously – an organisation that can at least deliver a higher turnout if it cannot poach the BJP’s hitherto sturdy voter base. 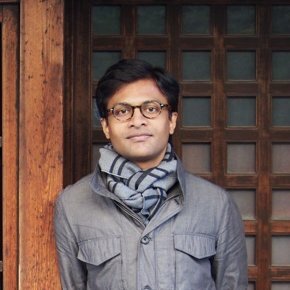 Anoop Sadanandan is a social scientist and author of Why Democracy Deepens: Political Information and Decentralization in India (Cambridge University Press, 2017).